Babies with inherited intolerance of fructose face a risk of acute liver failure if they are fed certain widely available formulas containing fructose, pediatricians and geneticists are warning. Baby formula manufacturers should remove fructose or sucrose, or explicitly label their products to allow parents to avoid those sweeteners if necessary, the doctors say. In a recent paper in Molecular Genetics and Metabolism, Emory geneticists Hong Li, MD, Ph.D. and Michael Gambello, MD, Ph.D. together with Children's Healthcare of Atlanta pediatric hepatologist Miriam Vos, MD and colleagues report four cases of hereditary fructose intolerance (HFI), all diagnosed in early infants. All had acute liver failure that resolved when the infants switched to formula without fructose. HFI is estimated to occur in 1 out of 20,000 live births. It comes from mutations in the aldolase B gene, resulting in an inability to metabolize fructose. Early symptoms include nausea, vomiting, abdominal pain and failure of an infant to gain weight. If unrecognized, HFI can result in liver and kidney damage, seizures or death. HFI-related problems do not appear if an infant is being breastfed exclusively. It is normally recognized when fructose-containing solid foods, such as fruit, are introduced into the diet several months after birth. However, some baby formulas – often soy-based – contain sweeteners such as high-fructose corn syrup or sucrose (table sugar), which is made of fructose and glucose linked together. Sometimes, the label only says "sugar" instead of sucrose. "In some of the cases we describe in this article, the treating physician had to call the formula manufacturer to confirm that sucrose was a component," says Li, assistant professor of human genetics and pediatrics at Emory University School of Medicine. "It underlines why accurate and explicit labeling is necessary." In babies with digestive problems or allergies, parents or pediatricians may seek to avoid formulas based on cows' milk. However, in alternative formulas, there is a higher chance the manufacturer will add sucrose or fructose as a sweetener and carbohydrate source. HFI is, in a sense, a mirror image of galactosemia, an inherited intolerance of lactose which Li says is better known. "Most pediatricians are aware of galactosemia, and the liver symptoms that may bring an infant to see a doctor actually resemble galactosemia, even if they come from a different origin," she says. "In the case of HFI, choosing formulas that avoid lactose, like soy-based formulas containing fructose or sucrose, can make things worse." Gambello, associate professor of human genetics and pediatrics at Emory University School of Medicine and Section Chief of the Division of Medical Genetics, notes that HFI occurs frequently enough that several babies can be expected to be born in Georgia every year with the condition. The paper reports on two cases from Georgia and two others from Ohio and California. In two of the cases, there was a family history that suggested a risk of inherited metabolic disorders, but a precise diagnosis was not available. Doctors thought one of the cases looked like a mitochondrial disorder. Another was initially suspected to be an infection due to the combination of acute liver failure, hypoglycemia and bacteria growth in the urine. 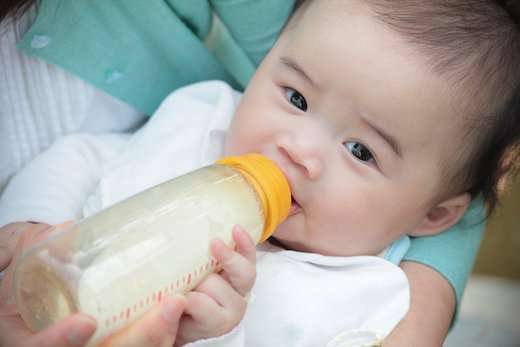 Since HFI is a treatable disease, Li urges pediatricians to consider HFI as a potential diagnosis if there is a feeding problem, elevated transaminase enzymes or jaundice (a sign of liver damage) and the infant has been fed formula containing fructose or sucrose. Some information about a young patient's condition can be obtained from urine carbohydrate tests, but the only way to confirm HFI is by genetic sequencing. In any case, the solution is simple: avoid foods and formulas containing fructose and sucrose. "Once parents switch formula, improvement happens very fast," Li says.